This year’s NBF Show will see Airsprung Beds continue to provide exciting and innovative solutions for retailers. It will be a showcase for fresh Kids’ ideas, bringing excitement and flair to a relatively predictable market. In addition, Airsprung will be demonstrating its new, innovative Ottoman storage solution – a major first in the industry. There will also be some fresh ideas around natural fillings, fabrics and finishing details that so often make a product successful. As a benchmark brand for value, Airsprung believe that value does not mean utilitarian – many new and refreshing ideas have been created over the past few years and the growth in retailers adopting the Airsprung brand are testament to the fact that they are a manufacturer that listens to its retailers and, in turn, their consumers. The first manufacturer to truly embrace online retail, Airsprung has matured in the market and now provides complete turnkey services for its online retailer base – the products themselves are only the beginning of the journey. Add to this a comprehensive Direct Home Delivery network, along with add-ons such as Collect and Recycle, and it’s easy to see why retailers trust Airsprung to make their lives easier and, ultimately, more profitable. Expanding on this successful formula, Airsprung launched its new premium brand Hush From Airsprung two years ago – with the same ethos of quality, service and value. However, the Hush From Airsprung offer was to be focused more on premium fillings and fabrics. It was also designed to maximise the potential of each mattress and provide a premium product with excellent specifications and exceptional value. This gave Airsprung a much wider offer which was designed to attract retailers with a more demanding remit. To date, this has been a huge success and with that success a greater demand for “Private Label” products. 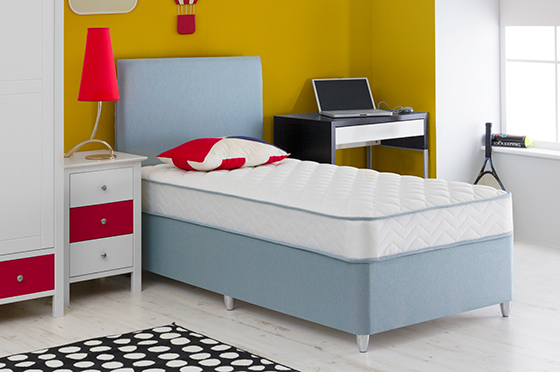 The largest retailers in UK now rely on Airsprung to design and produce their flagship models, be they divans, mattresses, headboards or ottomans. Teams of dedicated Trade Managers are on hand to look after their needs. Furthermore, Airsprung take every opportunity to share new ideas and innovation with its retailers, giving them a useful advantage in the market. With Airsprung consistently delivering on price, quality and service, it’s no wonder that more retailers than ever before are trusting Airsprung to deliver for them, and to their customers. Previous PostNBF’s Code of Practice adopted by trading standardsNext PostReimagining the no-turn mattress.